In the sauna we quickly noticed that in spite of our best efforts, it was hardly weather tight. This observation, combined with the very rough (rustic?) appearance of my cabin beams, quickly led us to decide to panel the inside of both buildings. 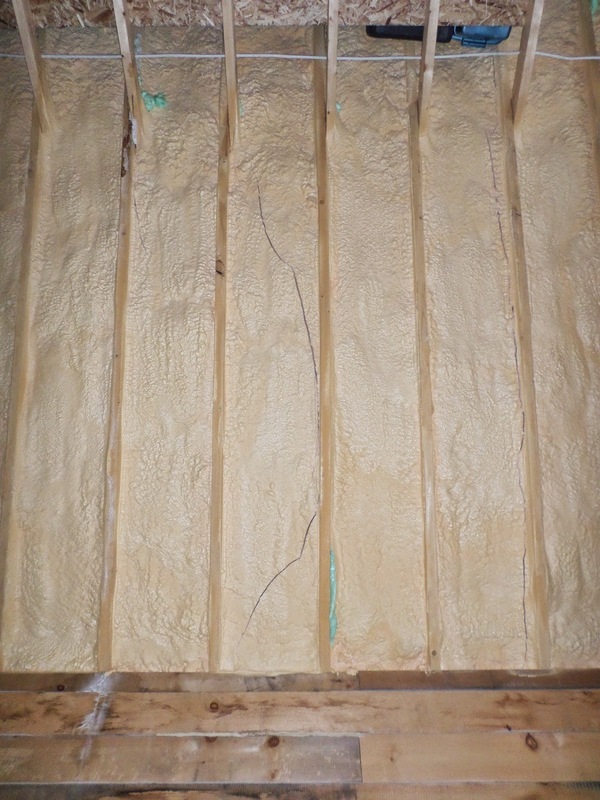 This also presented an ideal opportunity to add a thin layer of insulation and an air barrier. This project proceeded well in the sauna, halting mostly when my supply of 6" cedar panelling ran out. 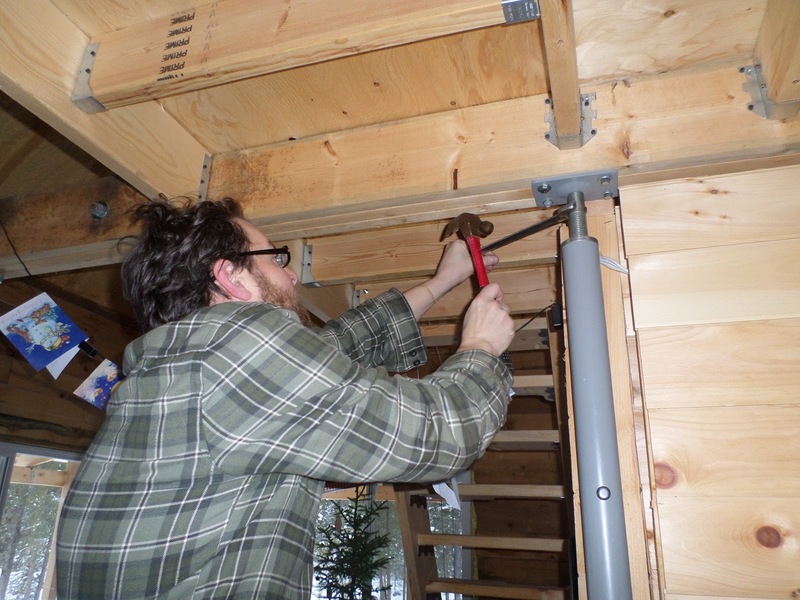 My father repeated the same process in our bathroom when they came to visit, and recently I've had the time and inclination to begin applying this to our entire cabin (extended periods of -30 degrees has also gotten me into an insulating frame of mind). I did a quick test run at the bottom of the stairs to the loft, which also gave me an opportunity to straighten out that wall, which had begun to twist inwards towards the bedroom. I put up a single sheet, admired my handiwork, and then after a brief discussion with Donna, decided to cut my teeth on finishing our bedroom, a part of the cabin that had been getting progressively colder and colder as time went on. When I got to the trim around the patio door in our bedroom, I was actually pleasantly surprised to discover that there were large gaps between the logs and the framing of the patio doors! I had forgotten that my father had only added foam to the outside of that perimeter before having to return home, and that the perimeter still had much work to be done before it could be considered "finished" or weatherized. 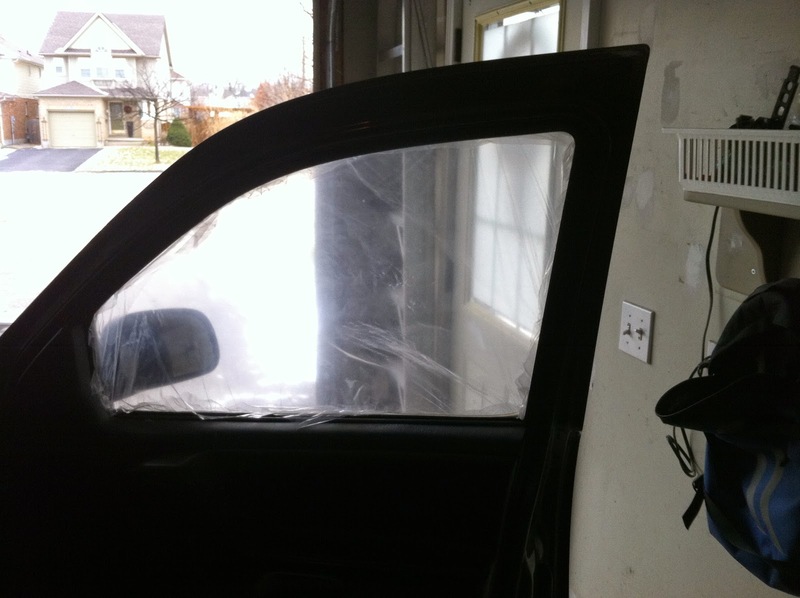 Luckily I had a few cans of window and door spray foam on hand, and I proceeded to use it in combination with sill gasket to seal up the door essentially air tight. This put me in mind to check the other doors in the cabin, and again I was happily surprised to realize that they too only had a bit of foam on the outside, and there were still large and numerous gaps visible from the inside which I could repair. Having a half can of expanding foam really motivates one to try to find locations to use it up, as it can be challenging to revive a can after it has been started. With the doors suitably foamed up, I returned to the bedroom and pressed hard to complete it. Which shockingly, I was able to do! I have purchased ten more sheets of 1/2" foam and still have loads of straps, so I will continue with this project and report back with how much of a difference it truly makes to the overall cabin. Of course, once it is finished, I will cover it with an air/vapour barrier, and then paneling to complete the aesthetic appeal. As anyone who has been subjected to my blog for the past little while knows, we have had constant trials and tribulations getting water from the well and into our lives. Mostly during the winter due to the extreme cold, and lack of ability to place our water lines in an insulated environment or to be able to supply them with enough electricity to run a heating cable on them. Our system has been working better than last year when we lost water in late December just before we headed off for Christmas. At the time, I was fairly sure that the water had frozen in the pipe where it passed through the well casing. I updated the heating cable arrangement and repositioned the water pipe to try to ensure that there was the option to heat that section of the pipe, as well as to prevent water from settling there. I would have to say that repositioning the pipe has been a real success. The heating cables, not so much. The last time I had them on for a few hours, I checked in the well and could see no evidence of even a little bit of melting. I admit that I foolishly did NOT insulate them, but I expected that they could at least melt a tiny bit of water around themselves, so I question if they are even functioning at this point. As an alternative to the heating cable, I have been going with the low tech approach of simply pouring kettles and pots of hot water from the stove back down the well onto the spot where the pipe passes through the frozen surface of the well water. An interesting side effect is that after closing the well cover, amazing crystals develop on the inside of the well casing as the steam condenses. This has worked a charm. So far it has thawed the pipe each and every time, although sometimes it does take a few heartstopping and stressful minutes after my last kettle goes down before the well pump manages to get some water up to the sauna. Of course, within the sauna the pipes from the water tanks to the taps have frozen as well, but they thaw after a few hours of heating the sauna, so we tend to draw lots of water on the days when we take steam anyway. If things change, I may let you know, but so far we are ahead of last years game, only schlepping buckets from the sauna to the cabin, instead of from the neighbours! In the very centre of the cabin I installed an adjustable jack post to allow me to lower the loft (and middle of the roof peak, by extension) as the outer walls of the cabin settled. While I can tell that the outer walls have settled a bit more than an inch, my monitoring with my level kept insisting that the main support beam and the floor joists attached to it were still true. This really shouldn't have been possible I think, and so the recent appearance of the stress fractures in my insulation gave me the impetous to make my first adjustment to the jack post. It was a devil of a time just getting started. My 1" wrench was too sloppy, and my 7/8" wrench was too tight. Grandpa brought over two of his antique adjustable wrenches, but neither one of them were able to fit. They could open the right amount, but the grips were wider than the flattened portion of my jack post, so I was unable to gain any purchase on the post. I added a 15/16" wrench to the shopping list and left it at that. The next day, while in the yurts fumbling for an unrelated tool, what should I uncover? You guessed it! My 15/16" wrench! I brought it in, and it was a VERY tight fit. I actually pounded it on with my deadfall mallet, and then used the mallet to turn the post once around (about an eighth of an inch drop). The next day I repeated the process and then decided that I had had enough for awhile. I did hear a number of creaks and bangs from the cabin over the next day or two, but I don't know if I should ascribe that to the adjustments I made, or the frigid temperatures we continued to experience. The next time I was at the hardware store, I opted to purchase a 25mm wrench, assuming that the jack post was metric and that would be the best compromise. It bemused me to later find the packaging for the post which marked the suggested wrench as a regular 1" - the first one I tried! I'm not sure why it was so loose in my case, but I'm happy with the 25mm wrench. In keeping with my new wrench philosophy, I hung the new wrench right on the jack post. My new philosophy, created in the wake of searching for the proper wrench size and location EVERY generator oil change (12mm in case you are curious) is that it is more economical to simply purchase a wrench for each location where it is needed on a recurring basis, and leaving it there, rather than trying to record and/or search out the wrenches from a toolbox as needed. I'll still keep a full selection in my tools, but for things that I use the same size for over and over again, I'll have a primary copy right on-site. As for the jack post, I will perhaps take another look at adjusting it in the spring. The settling of the cabin seems to have slowed based on the progress of the outer walls, and I have begun work on the panelling that requires some long-term stability from them. Post Script: CW! from church - tell my Dad I say hello! 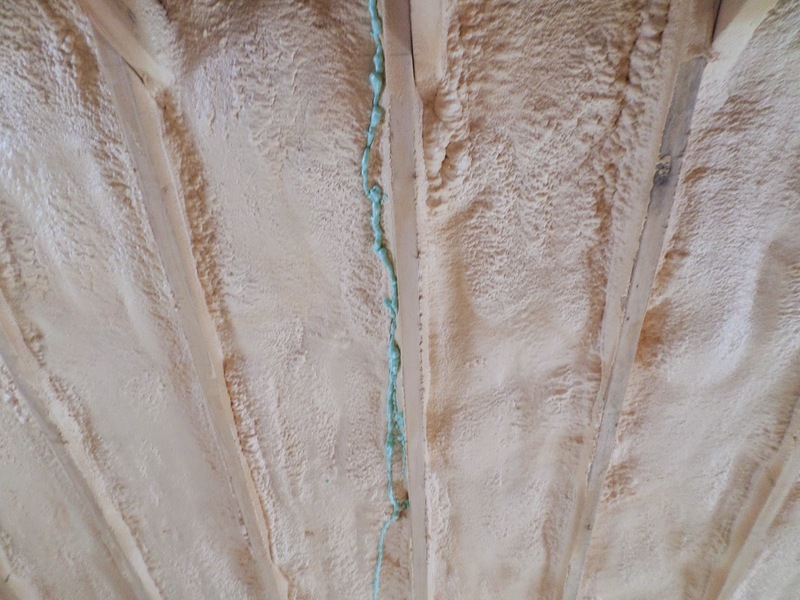 When Ranta Contracting quoted us on our cabin roof, I accepted the significantly increased price tag and had the roof and gables insulated with spray foam. It doesn't take much research to realize that it is probably the best product one can install in their building. The cost is more up front, but it saves so much on work and future heating costs, that it must be seriously considered in any construction endeavour. 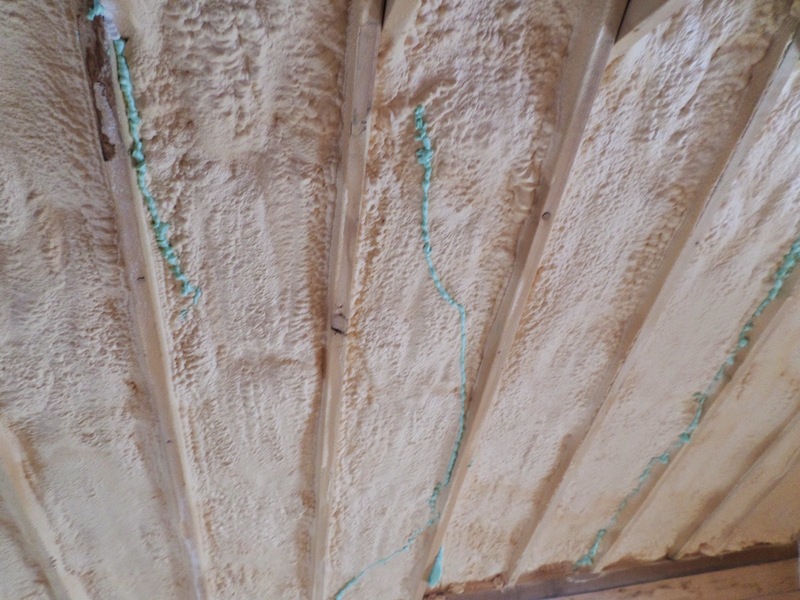 The insulation was installed by Thunder Bay Insulations and has performed great for the past year, keeping the loft of the cabin constantly toasty warm. 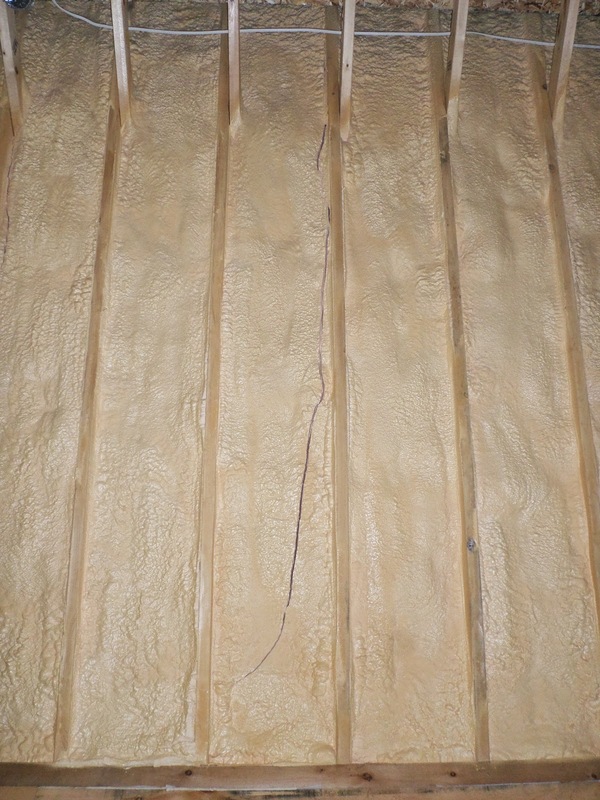 I was surprised and bemused to discover on our return from the tropical heat of southern Ontario that a few long, but thin cracks had appeared in the south side of the roof. 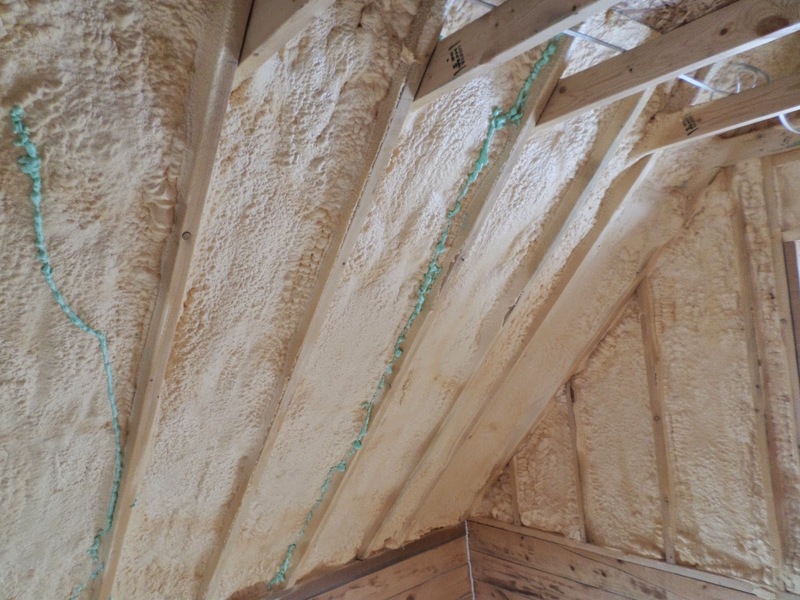 A quick conversation with Kyle at Ranta, and we had an appointment in short order with the owner of the insulation company. He was quite surprised and overly apologetic when he saw the cracks. We are using the working theory that the cabin has settled slightly unevenly, causing the dramatic stress fractures on the foam. In short order he personally set up his ladder and repaired the cracks. I am more than satisfied with my experience with him, and would happily recommend his company to anyone else, as I'm sure standard construction techniques are free from these sorts of dangers. Thank goodness that's one less thing I have to obsess or worry about! Over the holiday break, Kenny and my parents took in The Penguins of Madagascar at the theatre in Waterloo. You can imagine my concern when I realized that although the movie had ended about an hour earlier, they still weren't home. This was compounded when their home phone rang, and upon answering, I was informed by the local police that there had been a 911 call placed by my Mom's cellphone and they were following up on it. As it turns out, when they left the theatre, they discovered that their passenger window had been broken and a pair of $10 binoculars and some small change had been stolen. I found it interesting that their GPS was left unmolested. I suppose the advent of cellphone GPS applications has made single purpose GPS units rather less attractive. Mom had called 911 first, before being directed to call a more local, non-emergency number. I suppose they still follow up regardless. It was a relief to know that they were safe. I think at first that made Kenny a bit subdued. It was likely a cold, windy drive back from the theatre, and he was quiet when he first returned. It wasn't until a little later that he opened up a bit more about the movie. In the meantime, it was New Year's Eve, and Nana and Papa needed a solution until a glass place opened up to do the repair. Papa found a sheet of plastic that would fit the bill, and had his roll of duct tape in hand ready to enact a typical repair. I wanted to see if there was some way that we could improve on the standard fix for this situation. I didn't think that duct tape would be the nicest to his paint and interior trim, at the very least, leaving an icky mess to clean up after the window was repaired. 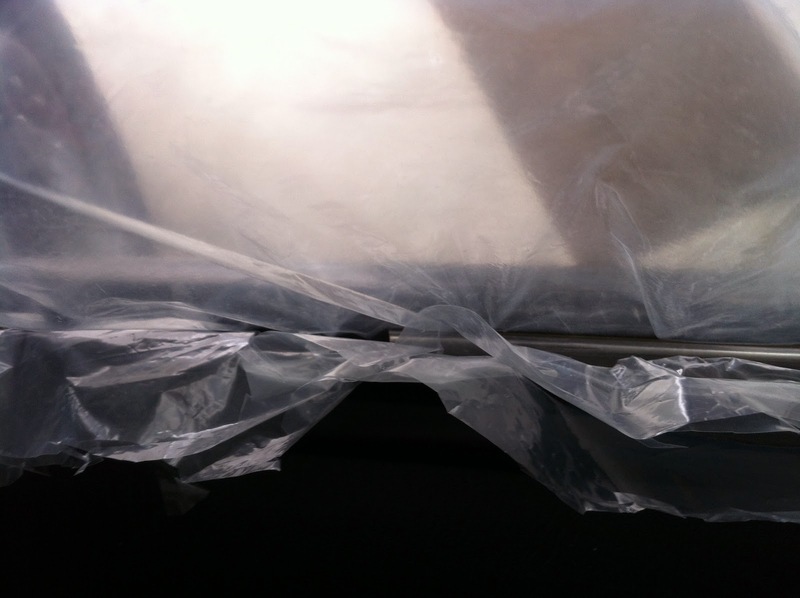 My solution was to take a length of nylon hose that he could spare, and insert it like a spline all the way around the window opening. 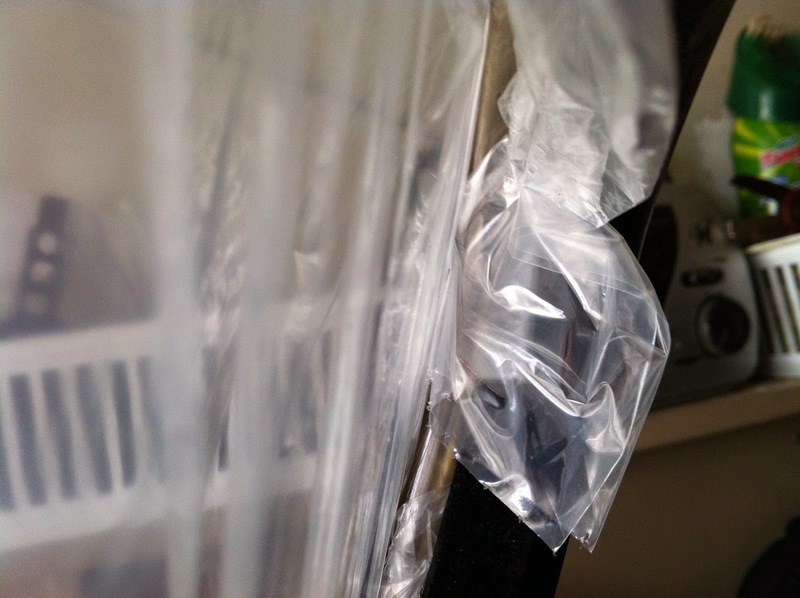 This actually worked a charm, although eventually the pressure of the wind on the plastic did lift the bottom edge and required it to be reset or reinforced with a small piece of tape. 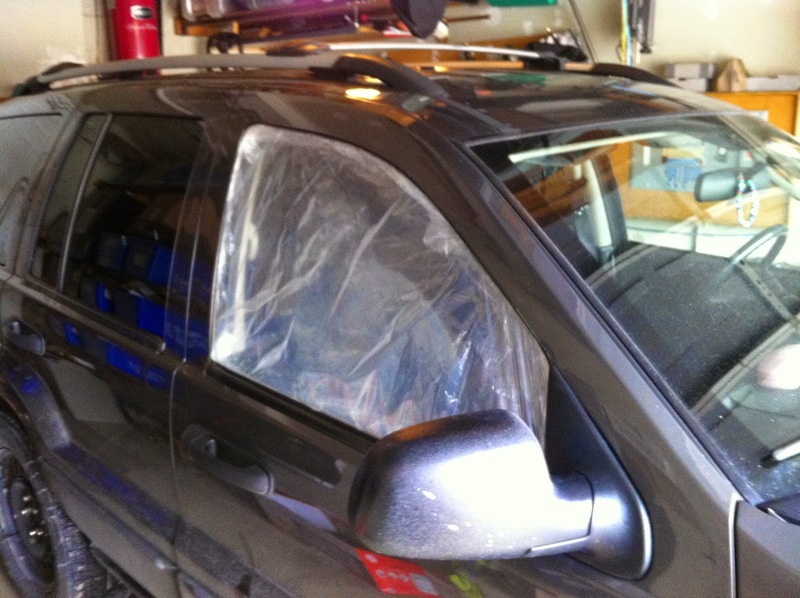 He was able to hold on until Saturday, when Star Auto Glass opened and was able to do the repair for them. It was a hassle though, cancelling our plans to go out to the family activities on New Year's Eve. It has gotten me into the frame of mind that perhaps I will not bother locking my vehicles unless there is something of value in them - the thought being that theft of the entire vehicle is very unlikely, while the odds of a broken window in the search for something of value is small, but significant (I have had my vehicles broken into on three occasions in the past fifteen years or so). Feel free to use the hose as a spline idea - I haven't patented it yet! After a brief hiatus for the holiday season, we are now back at the homestead, and raring to continue our ongoing process of Kaizen. I can't speak to the success we will have with these projects, but they are most on our minds of late. It will be interesting to see just how all these things pan out. It seems that one of the first rules of homesteading is that it's incredibly difficult to predict where you will be required to spend your resources, and just how many resources you will be required to spend :). Reflecting on the holidays briefly, it was nice to have a celebration this year where our families focused more on simplicity and time with one another, rather than gifts and more material things. We certainly appreciate the thoughtful items we received! But our love of our families flows from who they are, and not what they can give us. I was a bit disappointed that I was unable to get to church over the holidays. We have many friends there who we miss and would have liked to have given personal best wishes to. Weather seemed to conspire against us. It was nice to visit my Grandmother again, and have Kenny get another opportunity to see her. I always feel blessed to have had a chance to get to know Grandparents and Great-Grandparents a bit before they left us. I'm sure Kenny will understand how fantastically blessed he is to have such amazing and wonderful Grandparents in his life and so accessible. I hope that everyone had a nice holiday break, and can find something to look forward to this upcoming year!